In our hero-worshipping culture, what happens when someone hailed as a hero rejects that label? On January 28 of this year, during the snow storm that paralyzed much of the U.S. South, Dr. Zenko Hrynkiw received a call that an emergency brain surgery was needed to save a patient at the hospital where he works, Trinity Medical Center in Birmingham, Alabama. At the time, he was six miles away at another hospital, Brookwood Medical Center, where he had been assisting another doctor in surgery. Only this wasn’t an ordinary day. 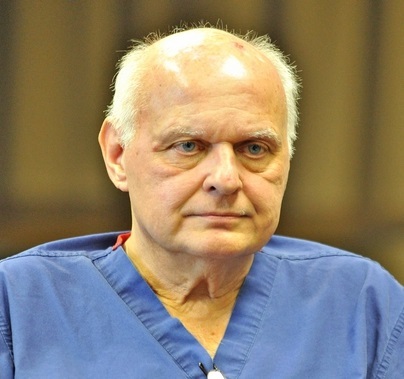 Dr. Hrynkiw attempted to drive over to his hospital, but he didn’t get far. The roads were jammed with accidents, stuck vehicles, and roadblocks. So he got out of his car and started walking. Along the way, he used his cell phone to keep in contact with Steve Davis, the charge nurse at the neurological intensive care unit at Trinity Medical Center, getting updates on the patient and giving instructions for medications and preparations for surgery. Without immediate surgery, the patient had a 10% chance of survival. Dr. Hrynkiw was not going to let him die—snowstorm or no snowstorm. When AL.com picked up the story, Dr. Hrynkiw was hailed as a hero. Interviewer: Why do you think this is such a big story? Dr. Hrynkiw: It’s not. I don’t understand it. (pauses) It’s not a story. Interviewer: Everyone seems to be calling your actions “beyond heroic.” Do you feel like a hero? Dr. Hrynkiw: No! I think this is much ado about nothing. I mean, basically, that’s my job, and you know, you gotta do what you gotta do. He matter-of-factly described the events of the day and the patient’s almost certain death if he didn’t make it, adding that it wasn’t going to happen on his watch—as if walking six miles in the snow is just what an ordinary human being does in the course of his job. And you know, he’s right! Do we deserve praise for doing our job? As far as Dr. Hrynkiw is concerned, he did not deserve any special praise. He was just doing his duty. He is trained as a neurosurgeon, and he is the only neurosurgeon on the staff of Trinity Medical Center. Yes, it’s wonderful that he saves lives. And it’s wonderful that he walked six miles in the snow to do it. But what’s all the fuss about, he asks? Isn’t that just what I’m supposed to do? I hope the answer would be yes—assuming we are physically capable of it. And Dr. Hrynkiw is a regular walker, who keeps himself physically fit. Though he was a bit chilly at first in his hospital scrubs, he described it as “a beautiful day for a walk.” He warmed up fairly quickly. In fact, by the time he arrived at Trinity Medical Center, he was sweating! Then he briefly spoke to the family, and got to work, saving the patient’s life. Don’t get me wrong. It’s great to recognize people who do a good deed. But on this one, I’m with Dr. Hrynkiw. This is just what we human beings are meant to do for each other. ‹ What is the Meaning and Significance of Gilgal in the Bible? Thanks for stopping by. Good thoughts! and so I think Dr. Zenko is not necessarily a HERO – but instead, is a person who operates with excellence – and has a sense of duty with high conscientiousness. And it comes down to “how we look at a situation…” and truly, what a guy!! If I ever need a doc, well I hope to have this guy or someone with the same excellence! because that is one of my favorite lines I use with my boys – like at times when I am holding my stance in a non-negotiable area – I actually say…. This is how human beings should operate, even if many of us don’t. Hey Lee – don’t take this the wrong way, but this is the second time I have gotten haughty vibe from you – it may just be your direct writing style – but in some of your tone I sense some pride – or as if you think you may be the authority on most things – haven’t been around enough to really know – but because of that I am going to unfollow – but bless you and best wishes in all that you do and in the readers that want your highly proclaimed formal expertise…. Sorry if I came across that way. Really, I was just agreeing with you. I do thank you for your thoughtful comments. Thanks, and no worries! I understand about the way many Christians come across. I don’t think that’s the true spirit of Christianity. I do appreciate your presence here!